The PCV, or pneumococcal conjugate vaccine, protects children against the streptococcus pneumonia bacteria. Pneumococcal infections are known to cause meningitis, blood infections and pneumonia, mostly in children. Though infections are rare they can lead to death. Before the advent of PCV, infections caused by the pneumococcal bacteria were attributed to meningitis, blood infections, ear infections and death. It is estimated that more 200 children under the age of five died every year from preventable infections. While medications are available to treat the bacterial infections, strains of the bacteria have become resistant to some drugs making treatment more difficult. Vaccination reduces the risk of pneumococcal infections dramatically. There are four vaccinations in the new PCV13 schedule. Prior to 2000, PCV7 was used for all four vaccinations, but a new vaccine, PCV13, has since replaced PCV7. PCV13 protects against 13 of the 90 strains of pneumococcal bacteria. If your child has completed the PCV7 series of vaccinations, one dose of PCV13 may be given to protect against the six added strains. 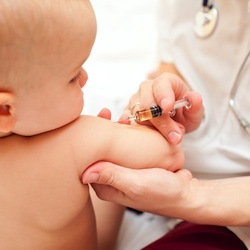 The 1st dose is administered at 2 to 6 months; subsequent doses are given at 8-week intervals with the final dose administered at 12 to 15 months of age. Mild reactions typically resolve within a day or two, but more severe side effects should be reported to the pediatrician or family physician. Mild fever and injection site pain can be treated with over-the-counter pain medications approved for fever reduction, but only with the advice of your child’s doctor. If your child is moderately to severely ill, the PCV shot will be postponed. Children who have experienced a severe allergic reaction to a previous PCV shot or vaccines that contain diphtheria, including DTaP, should not be vaccinated. Older children can be vaccinated with PCV, but PPSV23 is typically used in place of PCV13. If a child completed the PCV7 vaccination schedule, but they are between two and five years of age, one dose of PSV13 should be administered. If your child has a reaction to the PSV13 shot, contact your physician’s office for further advice. Severe allergic reactions should be treated with emergency medical attention immediately. Symptoms of a severe reaction may include shortness of breath, wheezing, hives, difficulty breathing or increased heart rate.